Our last brunch was a bit last-minute. It was a couple weeks ago and the planning started on Friday, I think, with Paul messaging me as to whether we were interested in brunching at his place on Sunday. On Saturday, he laid out his menu ideas and we assigned tasks during a quick phone call and then we went grocery shopping for whatever items we didn’t already have in stock. On Sunday, Josh, myself, Brian and Rita trooped over to Paul’s house to get the party started, so to speak, with him and his roommates. There were seven of us total, and Paul and I did the cooking. We had two versions of a chorizo-potato scramble (one with regular Mexican chorizo, one with vegetarian chorizo), red and green bell peppers stuffed with eggs, milk, veggies, herbs and cheese, refried beans, tortillas, various accompaniments, fruit, mimosas and cinnamon martinis. There was also pie. The godmother of all pies, in my opinion. The night before, Paul had made two cinnamon pies (yes, Psych fans, inspired by the Twin Peaks episode) and we ate one with dollops of homemade whipped cream. None of us had ever had such a thing before and it was pretty fantastic. Sweet, delicate, light—sort of textured like tres leche cake–and the cinnamon level was perfect. It was the kind of pie you just want to eat and eat and eat, with a cup of steaming hot cocoa on the side, on a cold snowy day (or as we in Michigan call it, “November to April”). The recipe for that is at the bottom of the page. None of the dishes we made were particularly difficult. For the scrambles, Paul parcooked chopped potatoes the night before. Then that morning, we cooked the chorizo, removed it from the pan, then sautéed onions, garlic and potatoes in the juices before adding the chorizo back in, topping it all with eggs and letting it bake in the oven until the eggs were set. The peppers were stuffed with about two eggs each mixed with some milk, herbs, veggies and topped with cheese and baked until set. We made mimosas and then martinis with vodka that Paul had infused with cinnamon and apples. It’s the way meals with your friends should be—low pressure, multiple people can do a little bit to help out (chopping, sautéeing, making drinks), there’s a good variety of easy to make dishes and plenty of opportunity to just hang out, relax, eat, drink and be merry. Simple. The way brunch was always intended. Speaking of simple, let’s move on to biscuits. 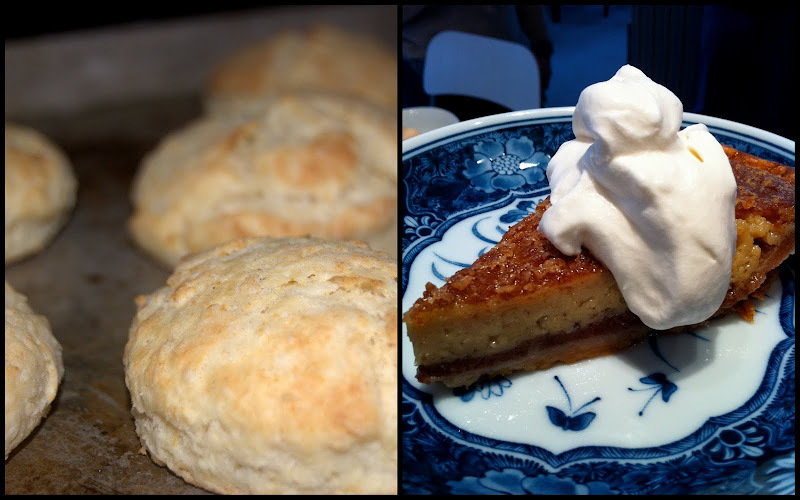 I think biscuits are, for people who don’t generally make them often–given a bad rap for being difficult. The taste isn’t there, or they don’t rise, or they fall apart or something. Or we think they’ll take forever to make…I mean, bread from scratch on a Sunday morning? Uh, no thanks. Goodbye rolling pin, hello Pillsbury. Right? No. Do not be afraid. Biscuits are perfect for brunch. 1. Both words start with B. Clearly this means something important; alliteration is only ever used for good, and not evil. 2. 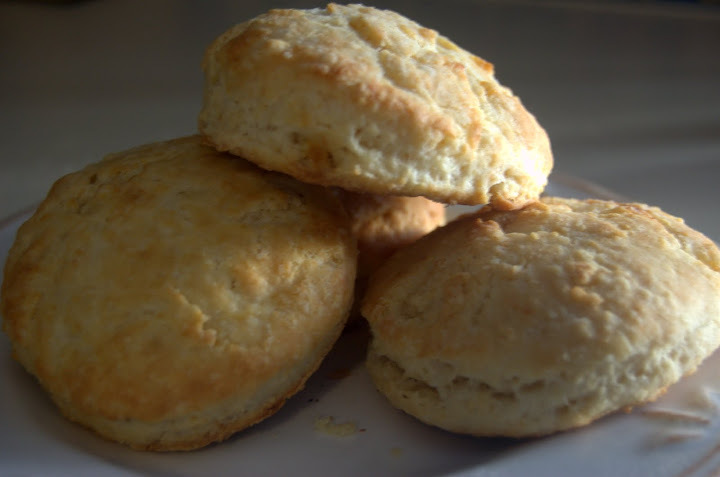 Biscuits are deliciousness embodied in a delicate, flaky, buttery form. Food is art…and biscuits are like Botticelli’s Venus. They call to you. Look, over there. It’s a biscuit…in a seashell. Of awesomeness. 3. Biscuits are extremely flexible in terms of companions. I don’t want to say that biscuits have loose morals or anything, but they really get around the table, if you know what I mean. Butter, jam, gravy, cheese, grits, meats of varying stripes of fat. Even hollandaise. I know. I know. Even hollandaise. 4. 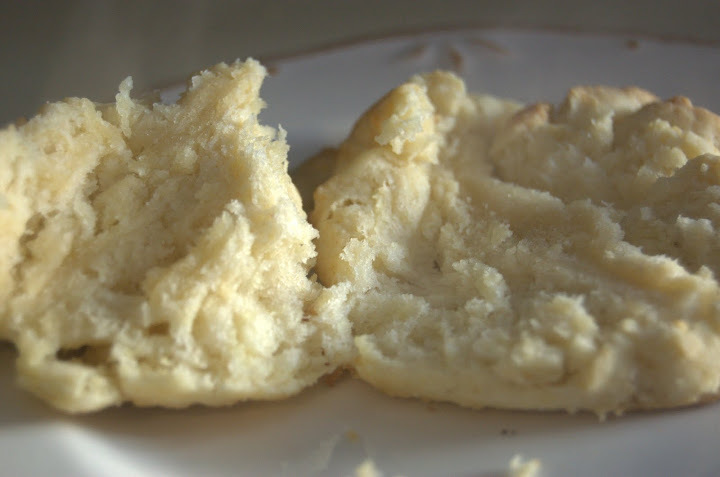 Biscuits are easy to make and they can be made in 20 minutes or less. Yes. 20 minutes?! you say. But Lauren, how can that be? Never fear, dear anonymous internet person. Let me take you on a fantastic voyage. Picture yourself in the passenger seat of my nuclear powered flying car while we soar through the sky, flanked by pegasuses (pegasi?) towing lovely biscuits seated on giant seashells of butter. Or…just read the recipe below. Put flour, baking soda, baking powder and salt in a large mixing bowl. With your hands or a fork, add in the cold butter a bit at a time, mashing it into the flour mixture until it all resembles a course meal with tiny lumps of flour and butter. Add in the buttermilk. Mix everything together thoroughly but try not to mix too much–you don’t want to overwork the dough. Gather the dough (it’ll be a bit sticky at first) into a ball and then dump it out onto a flour-coated surface. Roll into a 1″ thick circle. Using a cookie or biscuit cutter, or the edge of a round glass, cut out the biscuits. Grab up the remaining edges of the dough, pat back into shape and cut out any more biscuits you can. You should get about 8 or so from one batch of dough. Place biscuits on a cookie sheet that has been sprayed with baking spray, or laid with parchment paper. Mix honey with melted butter and brush onto the tops of the biscuits. Bake for 10 minutes or until risen and golden brown. Mmm. biscuits. Coat the pie crust with butter. Pour the cinnamon mixture into an unbaked 10 inch pie crust (a glass pie plate is best). Bake at 400 degrees for 15 minutes, then reduce the heat to 350F and bake for an additional 45 minutes. Let cool and serve. (It may seem overly liquid-y, but it will set as it cools.) Refrigerate any leftovers.